On Saturday mornings throughout childhood, I woke up to the warm smell of berry syrup. I’d stumble downstairs, hair disheveled, and find my mom stirring a molten vat of blueberries or raspberries. She also tended a nearby frying pan where a paper-thin layer of batter sizzled. She kept her eye on both, but mostly the pancake, nudging its edges with a spatula to check its readiness. When those edges curled up, she’d grab them with gloved hands and flip the pancake. I know what you’re thinking, but you’re wrong — my mother never made a crepe in her life! 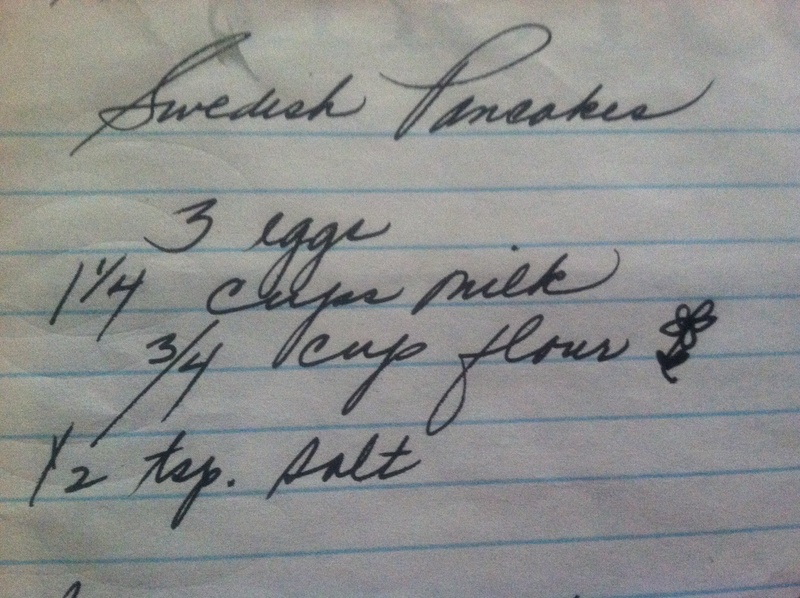 As a woman of Swedish blood, she made Swedish pancakes — thin, pliable pancakes designed to enclose sweet fixings. To this end, she’d stack the table with a bounty of sugary toppings: fresh whipped cream, powdered sugar, chocolate chips, sliced fruit, and homemade syrups. Of course, she’d balance the sweetness with a dose of savory: butter. Everyone in the family had a signature way of fixing their pancake. I always coated it in butter, layered it with a visible drift of powdered sugar, and curled it into a cigar. Ann usually loaded it up Pollock-style, splattering it with whatever looked good. My mom never skipped the whipped cream, and my dad never scrimped on fresh fruit. We feasted. We practiced this ritual with such regularity that it became somewhat of a “test” when Ann and I brought boyfriends around. My mom would set the table with all the toppings and we’d watch in breathless anticipation to see how he’d dress his pancake. It’s not that there was a right or wrong way, but there definitely was an appropriate enthusiasm level (VERY HIGH). I’m happy to report that both Dale and Nate passed the test. After mixing the ingredients, pour a thin layer of batter into a hot frying pan. Swirl the batter around to fully coat the pan and wait for the batter to slightly bubble in the center and curl around the edges. Flip the pancake and let it cook through. Serve with sweet toppings! What a great memory. Thanks for sharing your mom’s recipe with it. I love getting her recipes, she a fabulous cook. No doubt she has passed her love of cooking on to you. Congratulation to you and Nate. Love, LOVE weekend breakfast at the Klosterman residence. Sandy are you reading this? What do you think, Swedish pancakes this weekend? Dale you’re welcome ANY weekend. Just bring those grandbabies with!!!! !